We dove into the archives and pulled out James and Hugh Campbell’s childhood penmanship schoolbooks in honor of National Handwriting Day! These books are part of the large collection of historic family documents housed at the Campbell House Museum. Click the images below to see some snazzy old school penmanship. German apparently wasn’t Hugh’s strong suit. He ended up using the book for math problems. James Campbell mastering the tricky cursive “S”. James Campbell practicing his “au’s”. 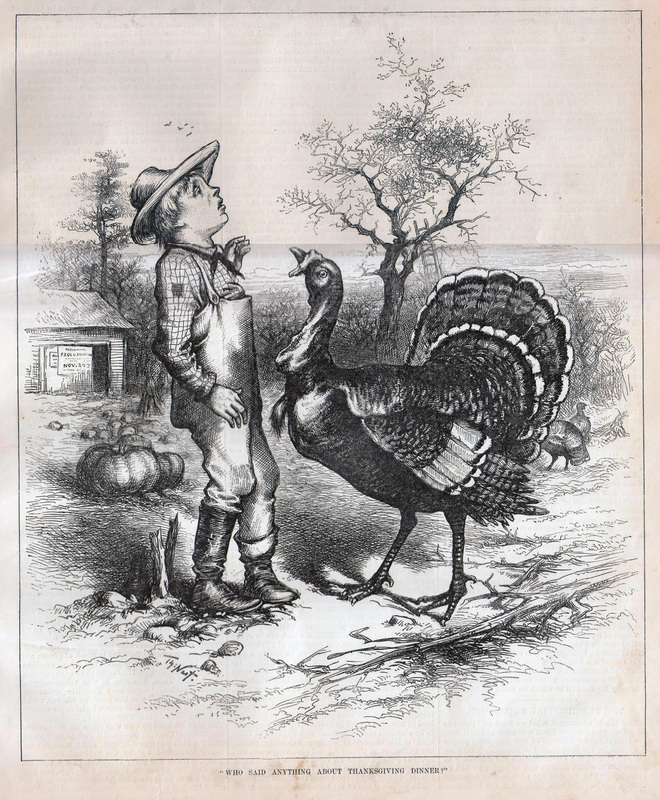 “Who said anything about Thanksgiving Dinner?” Harper’s Weekly: November 26, 1881 (click to enlarge). Last week we posted about the bizarre timing of early American Thanksgiving celebrations (i.e. sitting down to a turkey feast in June or July) and how, even into the 19th and early 20th centuries, there was no standard date to celebrate the holiday in the United States. Until Lincoln issued his national proclamation in 1863, it was the responsibility of governors to determine the date of Thanksgiving in their respective states. We did some combing back through Missouri’s history and matched up MO’s Thanksgiving dates with significant dates in the lives of the Campbells. Here’s what we came up with – the date of that year’s Thanksgiving day is listed, followed by a note about what the Campbells had going on that week. November 29, 1844 (Last Thursday in November): Robert Campbell Jr. died two days earlier on November 27 of the measles. He was two years and eight months old. December 25, 1845 (yep. They had Thanksgiving on Christmas): The Campbells were living in their first St. Louis home by this point, an attached row house downtown. Today Ballpark Village sits in its place. December 3, 1846 (First Thursday in December): Well, at least it wasn’t on Christmas day this year. 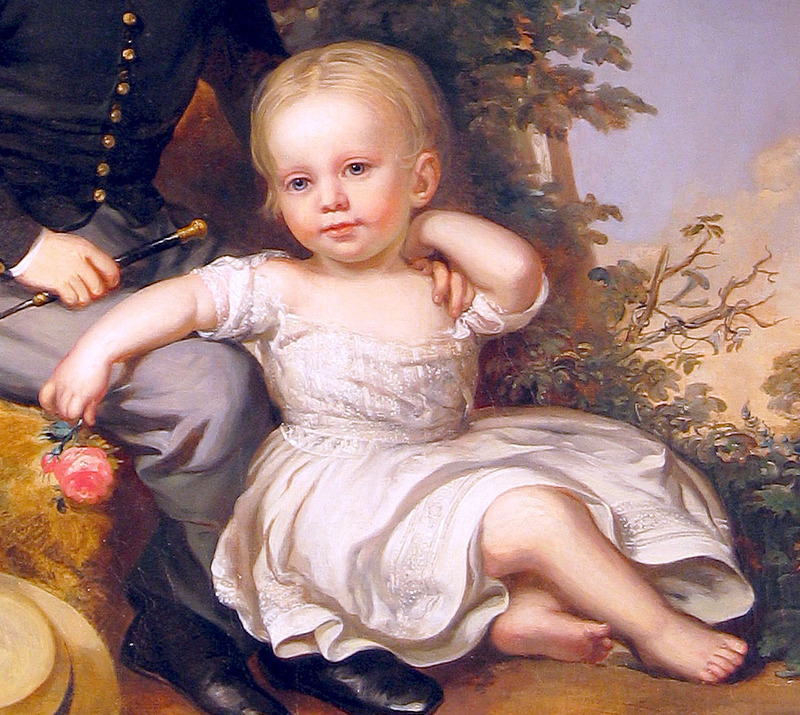 November 25, 1847 (Last Thursday in November): Virginia gave birth to Hugh Campbell, the third child to be given the name after the deaths of his two older brothers, ten days earlier on November 15. Hugh would be one of just three of the family’s children to see adulthood, managing the family estate after his parents’ deaths and dying at age 84 in 1931. 1849 (Missouri records show no Thanksgiving proclamation issued this year, so either the Governor or the state archivists dropped the ball. Our best guess is that it was observed on the last Thursday of the month): The Campbells weren’t even in St. Louis that November. 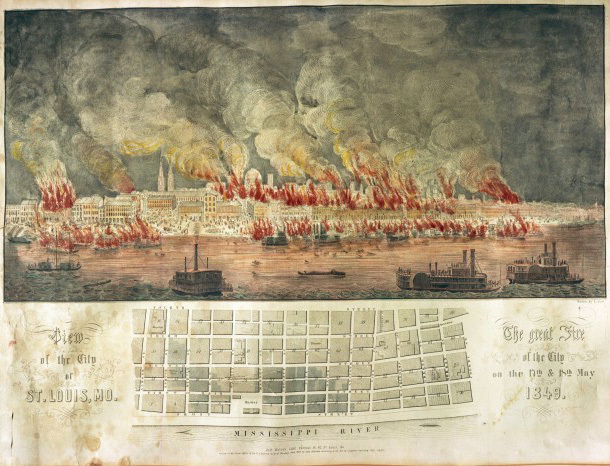 1849 was a bad year to be in the city, there was a enormous fire that wiped out most of downtown (Robert and Virginia’s home escaped, but his office near the riverfront did not) as well as a terrible cholera epidemic (caused by unsanitary drinking water) that killed their eldest son James. The Campbells packed up and headed to Philadelphia for several months to escape, and Virginia gave birth to their daughter Mary in September of that year. November 20, 1853 (Last Thursday in November): Hazlett Campbell was born three days later on November 23. Hazlett Campbell (1853-1856). Another son named Hazlett would be born in 1858 and lived until 1938. November 20, 1856 (Third Thursday in November): The same Hazlett Campbell dies on his third birthday, three days after Thanksgiving on November 23. December 31, 1857 (New Year’s Eve, Last Thursday in December): Grab your party hats and noisemakers, smooch that special someone, and shovel in a couple forkfulls of turkey and dressing to ring in the New Year. As you can see, Thanksgivings were a mix of happy and sad times at the Campbell House (and often at wildly different times of the year). The family was rejoicing over births and concurrently celebrating other holidays like Christmas and the New Year. But they were also dealing with the deaths of their children, disease, and the dangerous conditions of city living in the 19th century. Count clean water, safe conditions and healthy children among your list of “things I’m thankful for” when you sit down to Thanksgiving dinner this year! 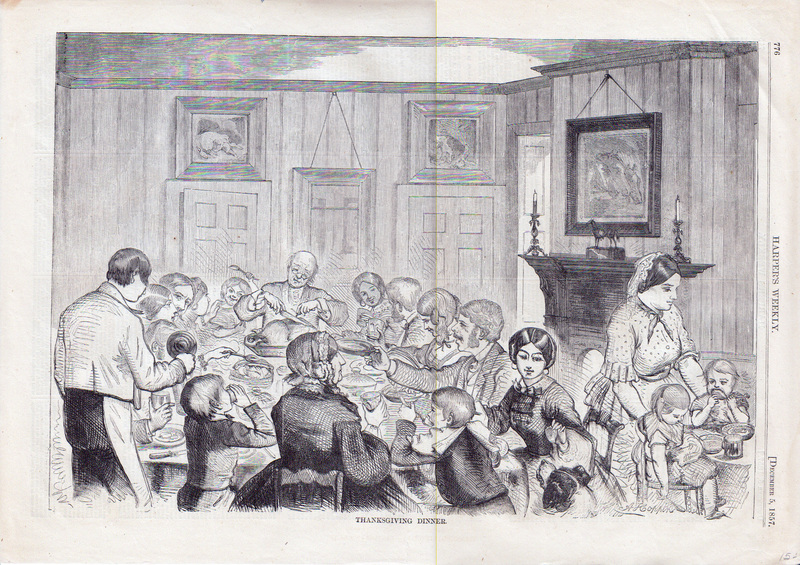 “Thanksgiving Dinner” Harper’s Weekly: December 5, 1857 (click to enlarge). Thanksgiving was on New Year’s Eve in Missouri this year.